Series exploring concerns about ageing. Fiona Phillips investigates the 'good, bad and ugly' sides of the social care system. Bill Turnbull asks if there is a point to cruises. -Everything has an impact on your life. That'll do, I'll take everything I can get. Or slow down the ageing process just a little. we're going to pass them on to you! people seeking to challenge it. So, Eileen, what made you become a whistle-blower in the first place? and I started to see widespread abuse of people. difference between forgetfulness and memory loss. And does your age matter when it comes to holidays? I've been finding out more on the road and on the waves. consider when they're travelling is insurance. been more expensive than their flights. -That's a question that's been coming up time and time again. but what about within the same postcode? My interest in social care started when I experienced it at first hand. age, and both, I feel, were very badly let down by the system. to cover again, to see how far we've come in the years in between. Have things got better or have they got worse? Some residents were given overdoses or the wrong medication altogether. saying he wanted to die. then the answer to my question is quite clear. Betty, who has dementia and heart problems, was in a nursing home. The family had concerns, so put in a secret camera. her head is slammed back into the chair. No, I don't want to! care system that matter the most. went into Woodgate care home in Maidstone. It's since been demolished, but was run by the Abbeyfield Kent Society. -around with the meds trolley. "Do you know when your mum's meds are going to be delivered?" And she said, "Your mum's meds. She says she hasn't had her meds for two weeks." Her mum's medication had included morphine patches. Clearly, without them, Rose had been in a lot of pain. surgery to the home, along with everybody else's meds. "we've got this system in place." Well, of course, it transpired that that system didn't work. family doctor that night, and she raced into town to a chemist. that said, "No meds, no meds." And I just couldn't believe it. Maggie complained to the Woodgate home and to Kent County Council. the police decided not to prosecute. thought to us and the effect it had had on us as a family. Maggie is now dealing with her father's care needs. I have time to drop you off and pick you back up later, if you want. The experience her mother had has left a lasting impact on the entire family. where she received palliative care following a cancer diagnosis. homes isn't just on the treatment side. raised. Are relatives or carers with complaints listened to? One woman who thinks not is Eileen Chubb. but she didn't get the reactions she expected. didn't want to speak out, because we were risking our jobs. And they all, without hesitation, said they'd give evidence. Eileen and her colleagues lost their jobs. it's vital that there are charities that challenge these organisations. -Well, you're not doing it for your own good, are you? we're seeing people suffer who could have been saved. but I don't want you to think that it's universally grim. group of clients with advanced dementia. So, let's see what outstanding looks like. That's it, now squeeze those hands tight, that's it. Have it nice and tight. There you go. -Are you ready for him? This home is all about light and space. Yes. You're beautiful, aren't you? their loved ones are happy to be here, which says a lot. there are always people with them. approach was the right approach for my mum. The people here just care so much. care so much and they treat them with respect. Hale Place is in the minority when it comes to care homes. Currently there are only 2% in England ranked outstanding. So, what are the secrets? I'm meeting with owner-manager Kevin Hewlett. saying, "This is the best thing I've ever done." that'll enhance their lives and literally make them happy. -The thing that we look for. Not going to hurt you, are they? Because we wouldn't let them do that, no. I'm going to meet the sheriff of this system. and I'm about to have a showdown with her. and a family directly to the person who should have the answers. sort that might signal a more serious cause? It's something that a lot of us worry about. with some advice you won't want to forget. Memory - it's a complicated old thing. but you can't recall what you had for dinner last night. and struggle with a simple password or PIN number. answering just that. It's called a memory clinic. different types of memory - and there's a lot to remember! What are the different kinds of memory? I try to categorise in four different ways. what we're talking about now, you'll remember what I've just said. what colour's an apple? And then finally, procedural. For example, how to switch on a television, how to ride a bicycle. Is it inevitable that our memory will worsen as we age? I use the analogy of general musculoskeletal fitness. as you get older, for your times to slow. does that mean you're on your way to developing dementia? Yeah, that's a good question, and the answer is absolutely not. affect your day-to-day functioning at all. You might just need to use some memory aids. you get older, don't panic. It could just be a sign of natural ageing. That's not to say you can't do anything about it, however. checkup, and we're going to see how it works. ..to have their memories put through the mill. Nice to meet you all. How you doing? Shall we start here? How's your memory? it's slightly worse. Particularly names of people, for example. How about yourself? Any concerns over your memory? -bring it back, basically, by going out and coming back in. I have to write things down and make sure I checked. -And you didn't used to have to do that? -I didn't used to have to do that. -Do you think your children have noticed your memory getting a bit worse? -What have they said to you? -they just tell me I'm getting older! So, time to see how I were volunteers fair with Doctor Ali's test. but today we're focusing on memory recall. -repeat those back to me. -And it's hard not to play along. John Deacon, 75 Beresford Road. John Beresford, 75 Deacon Close. On the number 100, keep taking seven away. Can you name the woman who was Prime Minister here, back in the 1980s? -The USA President was assassinated in the 1960s. Harry Barnes, 73 Orchard close. -And just one more time. I'm off to meet Doctor Sandrine Thuret from Kings College, London. ageing, and they've discovered some very interesting new research. So, Sandrine, how much do we really know about memory? memory formation, like episodic memory. the hippocampus, we can make new neurons as an adult. once they fully develop, that's it. So how does the growth of these new nerve cells help us? which is the ability of distinguishing similar memories. you bring your key and then maybe you will put them back in your bag. but in a slightly different place every day. the decline with certain lifestyle changes. But what are they? Time to separate memory fact from memory myth. a positive impact on our memory. -Yes, high sugar diet, high saturated fat diet are probably bad. Probably eating the actual fish would be better. which wouldn't reach, basically, the brain. What about brain training, like crosswords? We can do things that might reduce the rate of decline. -Is that fair to say? -really paying attention to this. but now it's time to get back to Doctor Ali's assessment. you did struggle a little bit with the mathematics-related question. My attention gets wandered a bit. question again twice, then you actually got the question wrong. facts, and that would be one technique you might use. but it was short-term recall that was the main issue. -Very commonly, it could be one of the earliest signs. you sometimes have difficulty finding the exact right word. that we see them first. It depends on the case. they didn't know. So what do they do now? memories remember the important things. used to be, are there some strategies that they can adopt to help them? time to take your medication every single day. to accompany you to appointments if you find that helps you. So, lots of different strategies you could use. when it comes to how we view the mind. But so much of it still remains a mystery. One - not all memory loss means you have dementia. your GP, who might refer you to a memory clinic. But let's leave the final words to our memory masterclass. So, what did you all think? How was that? if I can't remember things, not to worry too much. -So you are walking away from this empowered? there's plenty that you can do to slow down the process. One way of keeping your mind sharp, of course, is with our daily puzzle. what was the year that was? And here's why you should play along. wellbeing and vitality in us all. So this could help you hold back the years. MUSIC: Wake Me Up Before You Go-Go by Wham! Not everything Sir Geoffrey had said pleased Mr Gorbachev or vice versa. The basic disagreements are still there. We can do business together. And we'll give you the answer at the end of the show. put on your slippers and stay at home. -I've never owned a pair of slippers. Bill - you didn't tell me about this - went on an excursion to find out. and I mean a lot, of cruises. Exhibition Centre isn't a bad omen. well, we all need to look out for if were booking a break. And people here certainly seem to know where they're going. We've got Spain booked for Easter. We have a touring caravan and we're planning to visit Dorset. We're going on a cruise to the Baltic. -Well, we like Spain, don't we? They're also pretty confident about why they're going. Seeing different culture, seeing different cities. Eat what local people eat, and drink what they drink, and mix with them. So the world really is their oyster. Life's too short. Keep getting your holidays. With being retired, we can go any time, anyplace, anywhere. was once used to ferry passengers out to the Titanic. few years. Why do you think that is? saving their money in banks any more, they're spending it. So they just decide to travel. -Oh, they're getting more adventurous! The over-50s market, shall we call it, is actually now looking at soft adventure. Portugal, or wine-tasting in France. as well, otherwise you won't be covered. Things like this mean the older traveller has to be a savvy traveller. they actually have a lot of their knowledge in front of them. They know why they're travelling. the culture or it's on their bucket list, they want to visit. And one of the most popular ways to do the bucket list is by sea. We like cruising. We try to do one if not two per year. -We've done a cruise now, haven't we? -We've done a cruise. Yeah. -He would like to go back. the greatest growth that we've seen has been in cruising. and it's now up to about 40%. a cruise in the next 12 months. So what's so good about a trip on the ocean waves? Mediterranean, up to as far as Egypt once. To San Francisco, then all down the west coast of South America. I went on a cruise once. -I can't say it was my favourite travel experience. I'm wondering if you can help persuade me of the benefits. What's so great about going on a cruise? and thinking, "Oh, it's time for a drink," or "It's time for a meal." but last year he went on a cruise with this lady. It all began one lunchtime when he paid a visit to his local pub. I walked in there and there wasn't a spare seat in the place! And I was really looking for food, you know? as I know now, Vera, sitting at a table for two. So I said, "Would you mind if I sat and had lunch with you?" "No, no, no," she said, "come and sit down." -And in that half an hour, I talked her into coming on a cruise with me! -A woman you'd never met before? -Never met before. No, no. -She was very talkative, very, very nice, yeah. And she agreed on the spot? "I can't believe I'm doing this," she said. She kept saying this! I said, "Well, you are, because I'm going to pay for it,"
so I booked it and that was it. -You're a charmer, aren't you, John? he makes a good case for cruises, doesn't he? So maybe, just maybe, I should give them another go. But there is one kind of holiday I really don't think I could face again. site somewhere to relax and hopefully enjoy some nice weather. more and more people are caravanning. and actually the same goes for caravans and even motorhomes. with a chemical loo that had to be emptied every day. Neagh in County Armagh, where I'm meeting Morna and Chris Wells. -Welcome to our home on wheels! We go out every weekend, nearly. Last year, we were in Portugal and Spain. -The year before that, Finland. And then, before that, it was Poland. This year we're going to Germany. And you're king and queen of the road, I suppose. -I used to go on caravanning holidays when I was a kid. -But that can be a sense of adventure. -Is that what it was? You look at the memories that you have from that time. -Now, come on, there may be good memories, there must be some good times in there that you had. cramped in a small space with my family are definitely flooding back. -Only two people can sleep on here? -We have a bed above your head. -How's it work? Does it come down easily? -That's it, Chris. Whoa, whoa! You're going to crush Morna, you see? -Just pop that back quickly, Chris. -There is, of course there is! -Well, you have to take it in stages, you know! -mirror, to see how you look in the morning. -Oh, naturally. For when you put your ball gown on. -And we have a shower inside here, to your right. -It's very impressive, I have to say. OK. Well, have we convinced you, Bill? What do you think? -You can get a larger one. -Yes. I can't afford it! does it make you feel grand, king of the road? Well, you can't say I didn't give it a go. but I have a little surprise for John, who I met earlier. our next cruise to wherever. pieces together in case we go somewhere hot! -Vera doesn't know exactly where you're going. -Yes, yes. Italy and Croatia. -We will. We certainly will. And do you know what? I hope they do. Bon voyage. the bad and the ugly side of social care. with me. I decided, however, to bring some backup. people, I've discovered its many different sides. that will enhance their lives. other homes, even though we had no jobs. since she'd been in there, that said, "No meds, no meds." ..all of which have left me with many questions to ask. who's dealing with the care, who owns the care home. There are so many questions and I want to find the answers. And I know exactly who to go to. England, and at the very top of the Care Quality Commission. It's time, I feel, for a high noon showdown. otherwise known, what exactly is it? and we encourage services to improve. social care sector for Scotland, Wales and Northern Ireland. ..which they judge when making unannounced visit to care homes. How can you do that in one visit? what the issues are that we find. But it's not just the inspection. It's actually talking to the people about their experience. I've brought along a few messages. who runs an outstanding home in Kent, and this is his question. with care home managers and their staff. practice, they see outstanding homes, they're rating them. So, to share the good practice with all of us can only be a good thing. -between you, more accessibility to you, actually. finding out what he's doing and how he's improving. for themselves what makes those places tick. experiences, the reports do specify what makes a home outstanding. rated as inadequate or requiring improvement. institutions that come forward to complain. And yet whistle-blowers are still demonised. otherwise you wouldn't be a social care worker in the first place. services is that your staff are your greatest asset. identifying to you that there are problems. One such whistle-blower was Eileen Chubb. She lost her job when she made a complaint. Do you think whistle-blowers need to be protected? Do you listen to them when they have things to say? and they can share that information with us confidentially. names of people who share that information with us confidential. which includes the CQC for England. But sometimes, for the families, listening is not enough. Like Maggie, whose mother, Rose, was in a care home. Why do you not speak to the relatives? but also the good. We could be working as a team together. users, care users, would like to have more actual access to you. that they give us great insight into what's happening. that they have that direct access to you, the relatives? But relatives can also share their experience with us. talk to a real person at their call centre. and really ugly, bad care? the money that they've got, sensibly. Are they recruiting the right staff? are they focusing on the people who are using the service? be looking after that it goes wrong. And that's the thing that we have to guard against. It always has to be about the people who are using the service. So the signs today are encouraging. going to be there one day. And quickly, the answer to our "What was the year that was?" archive quiz for today. Fiona? -but we'll see you again next week. Bye-bye. Everything has an impact on how well we live, whatever our age - from the type of house we live in to how much money we've got to spend, what we put in our bodies and the secrets of our genetic make-up. So finding out about all those things - and more - could help you mature brilliantly - or slow down the ageing process, just a little. We've tracked down the very best tips and advice for holding back the years, and now, with the help of our team, we're going to pass them on to you, to show you how to have the time of your life - whenever that may be. In this episode, Fiona Phillips investigates the 'good, bad and ugly' sides of the social care system. 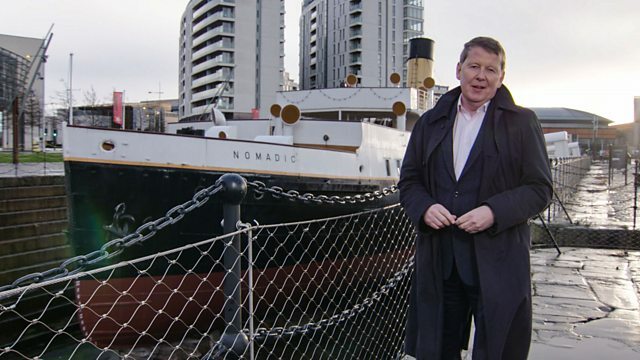 Bill Turnbull asks whether there is a point to cruises.